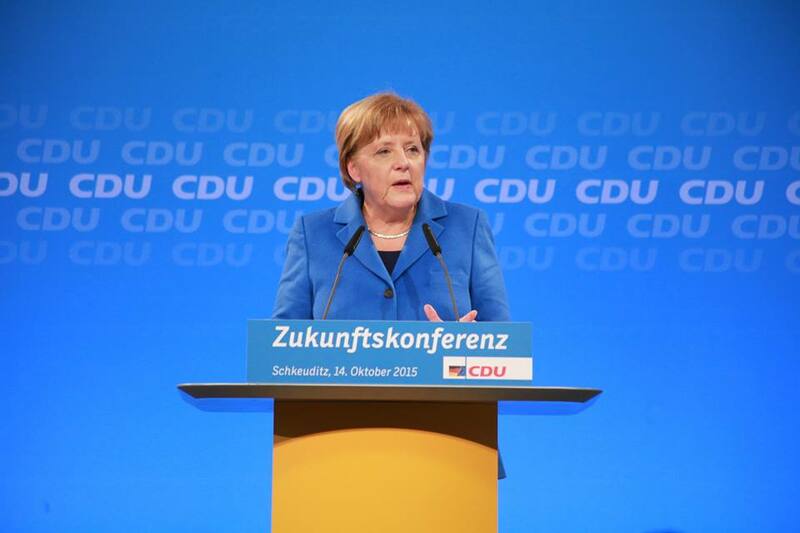 What kind of a deal can Greece expect after the German elections? 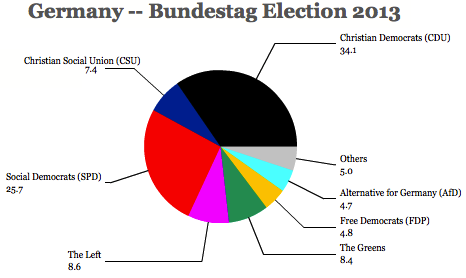 Europe may be a non-issue in the German election campaign, but it’s becoming increasingly clear that Europe will occupy a chief role in the agenda of Germany’s next chancellor, perhaps more so than exclusively German domestic issues. 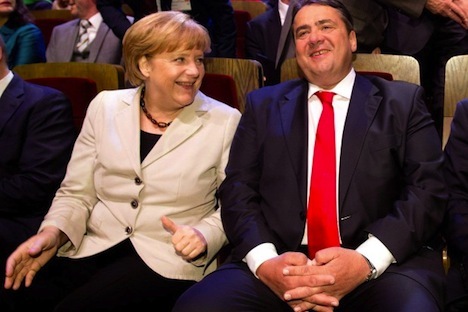 Though center-right chancellor Angela Merkel and center-left challenger Peer Steinbrück are both stridently pro-Europe, it’s an open question how to next German government should deal with the poster-child of the European financial crisis — Greece. 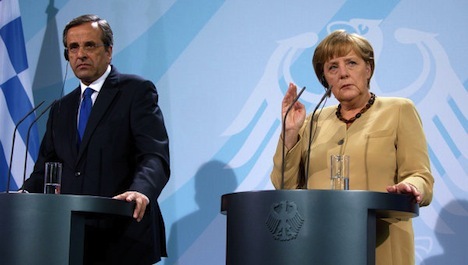 To understand Germany’s options requires an understanding of the underlying Greek politics — and how a Greek political crisis could plunge the entire eurozone back into panic mode. Even as Germany and the eurozone as a whole pulls out of the worst of the most recent recession, Greece continues to struggle with economic contraction. The economy is set to shrink by between 4.5% to 5% this year, the unemployment rate is a staggering 27.6%, and this follows five consecutive years of recession capped off by a 7.1% contraction in 2011 and 6.4% contraction last year. Greece remains trapped in a grueling internal devaluation where the private sector is being forced to accept leaner wages to make exports more competitive and the public sector is being forcibly downsized by the terms of the bailout programs agreed to by the ‘troika’ of the European Central Bank, the European Commission and the International Monetary Fund. Greece today is not a fun place to live, and Greek voters are angry at Germany in particular for forcing so many Greeks into poverty and joblessness while doing little in terms of fiscal or monetary policy to boost the country’s medium-term growth prospects. 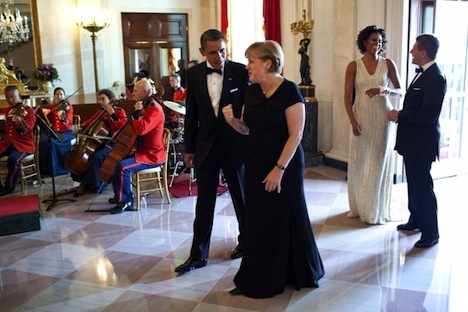 Back in Greece, that means a politically radioactive set of negotiations at a time when Greece’s government is reeling. A coalition between the two once-dominant parties since the return of Greek democracy in 1974, the center-right New Democracy (Νέα Δημοκρατία) and the center-left PASOK (Panhellenic Socialist Movement – Πανελλήνιο Σοσιαλιστικό Κίνημα) holds just a cumulative 155 seats, giving it the barest of majorities in Greece’s 300-member Hellenic Parliament. After the disastrous shutdown of Greece’s public television station ERT in June, the anti-austerity Democratic Left (Δημοκρατική Αριστερά) left the governing coalition — its leader Fotis Kouvelis previously agreed to join the coalition after Greek’s June 2012 elections in order to provide more stability for the country. Snap elections seem likely in any event sometime next year. 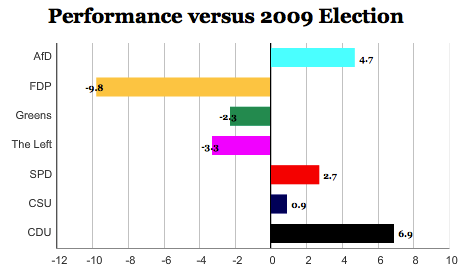 If elections were held today, SYRIZA (the Coalition of the Radical Left — Συνασπισμός Ριζοσπαστικής Αριστεράς) seems likeliest to win them, according to a recent poll, making the young, massively anti-austerity opposition leader Alexis Tsipras Greece’s radical new prime minister. 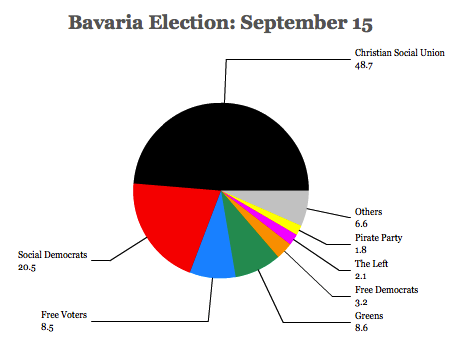 The Sept. 11 Public Issue poll showed SYRIZA moving into first place with 29%, New Democracy with 28%, and the far-right, neo-fascist Golden Dawn (Χρυσή Αυγή) would win 13%. PASOK, meanwhile, would fall to just 7%, the Greek Communist Party (KKE) would win 6.5%, the right-wing, anti-bailout Independent Greeks would win 5.5%, and the Democratic Left would win just 2.5%, less than the 3% threshold for entering parliament. SYRIZA has essentially consolidated much of the support of the anti-austerity left, so it’s puzzling how PASOK still attracts even 7% support, given that it’s subjugated itself almost completely to prime minister Antonis Samaras’s agenda. But Golden Dawn’s support is rising, and it’s likely to pull support from increasingly frustrated right-wing voters that once supported New Democracy, suggesting that if economic conditions keep deteriorating, Golden Dawn could draw even more support to a largely xenophobic, nationalist agenda. 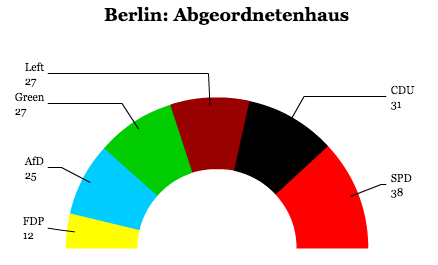 The possibility, long been referred to as a ‘Jamaica’ coalition because the colors of the three parties are those of the Jamaican flag — black (CDU), yellow (FDP) and green, has never happened in the Bundestag. 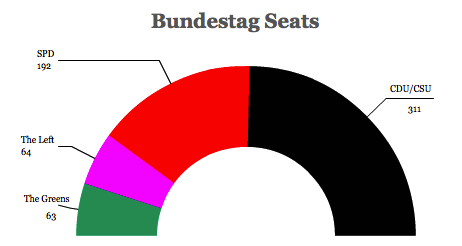 State-level examples aren’t promising – Germany’s first ‘Jamaica’ coalition in Saarland collapsed after just 26 months later, and a purely ‘black-green’ coalition in Hamburg didn’t fare much better between 2008 and 2010, ending after difficulties enacting education reforms. 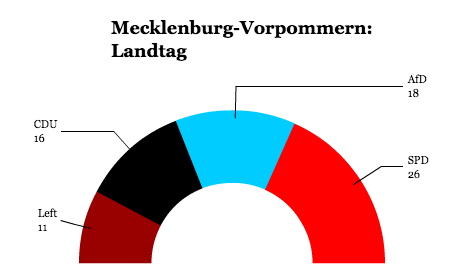 While it’s still more likely that Merkel will try to continue her current coalition with the liberal Freie Demokratische Partei (FDP, Free Democrats), the FDP is polling so poorly that it may not even return to the Bundestag — if it does, it will be with far fewer seats than the 93 seats it won in the previous election. 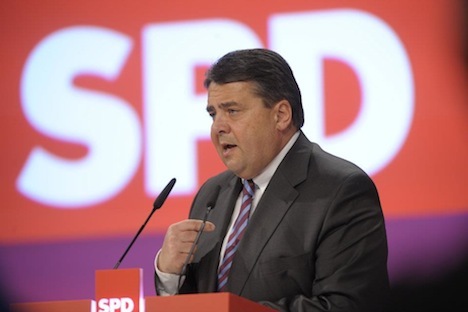 The likeliest alternative is another ‘grand coalition’ with the center-left Sozialdemokratische Partei Deutschlands (SPD, the Social Democratic Party), but given the difficulty that the SPD has had in drawing contrasts with Merkel since the 2005-09 coalition, there’s reason to believe another ‘grand coalition’ would be tumultuous and likely to end with early elections. 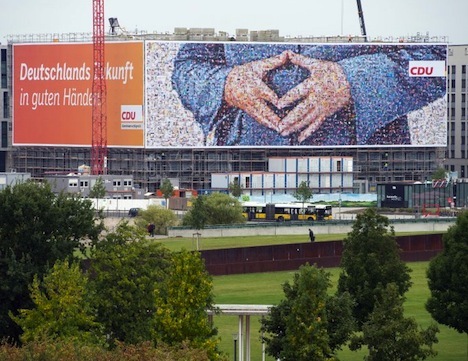 A CDU-Green union could give Merkel the best of both worlds — a more stable majority than the FDP and a more reliable coalition partner than the SPD…. 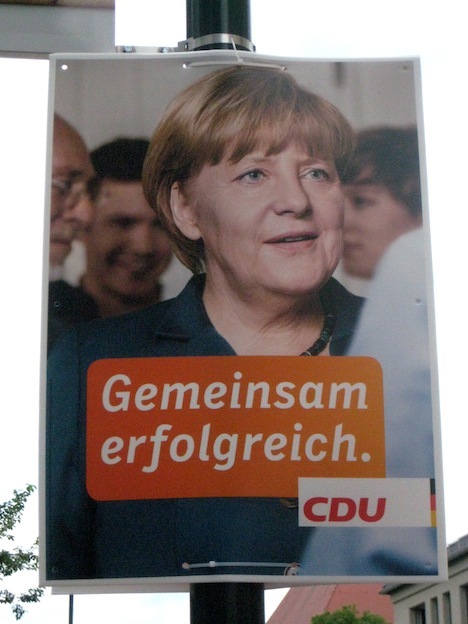 Merkel’s 2011 decision to phase out nuclear energy and to boost solar, wind and other forms of renewable energy made her an immediate ally of the Greens on their top policy priority, clearing what had been the chief obstacle to a CDU-Green partnership. 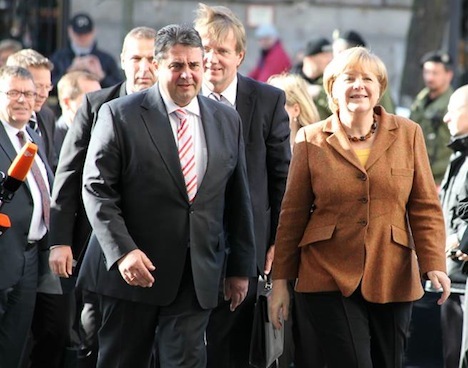 Otherwise, the Greens have long been among the most pro-European of Germany’s political parties, and former Green leader and foreign minister Joschka Fischer championed greater European federalism. 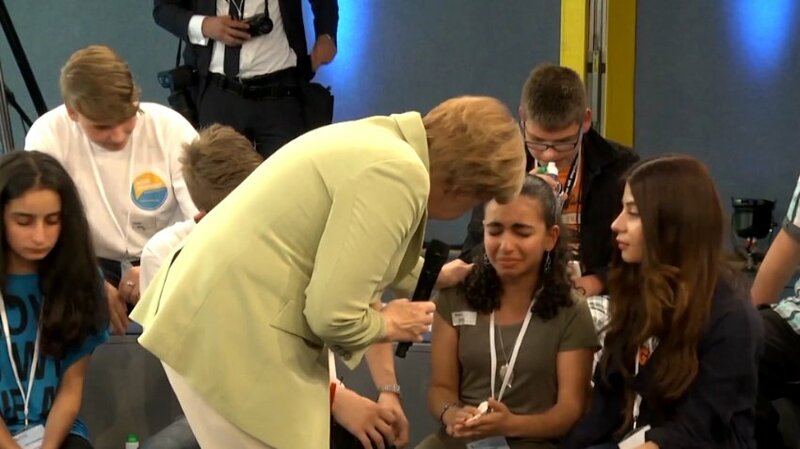 It’s not to say there aren’t problems with the idea, and there’s still a leftist contingent that would be appalled by a partnership with Merkel. 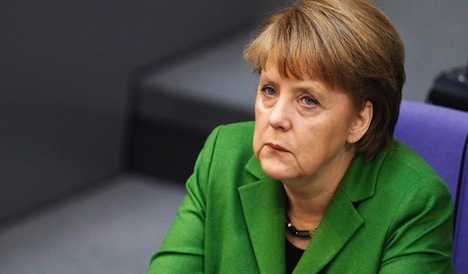 During the campaign, the Greens have called for a tax increase of up to 49% for the top rate and for an additional 15% wealth tax, and it’s unlikely Merkel’s CDU would agree to anything like that. 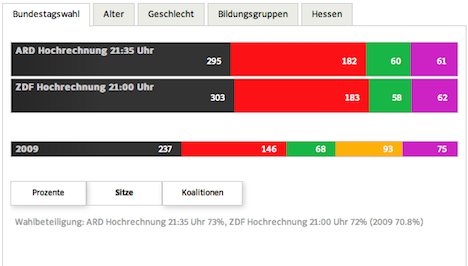 The Greens have always been split between fundi (fundamentalist / leftists) and realo (realistic / moderate) wings. But the radical 1960s-era Green leadership has given way to a more moderate leadership, personified by Katrin Göring-Eckardt, one of two Green chancellor-candidates and Cem Özdemir, a son of Turkish immigrants. 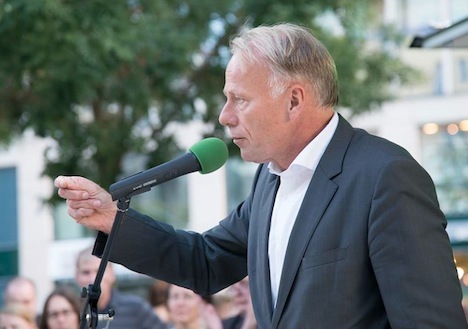 Even the more leftist Jürgen Trittin, the other Green chancellor-candidate, has espoused relatively centrist views. Meanwhile, Claudia Roth, the most stridently leftist Green leader, placed last in the race to determine who should represent the Greens in this year’s election. 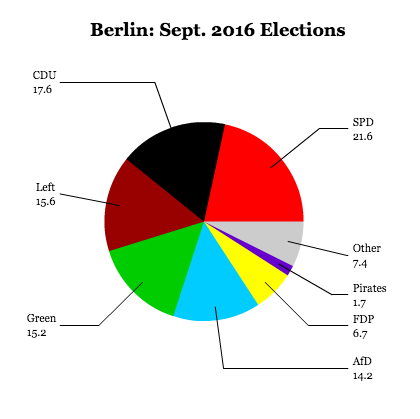 Perhaps the most promising sign for a ‘black-green’ coalition is the level to which Greens have governed pragmatically at the state level. 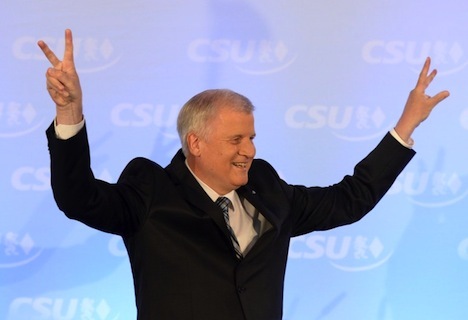 Although the Greens came to power in the southwestern state of Baden-Württemberg two years ago largely on the basis of opposition to the ‘Stuttgart 21’ underground train station project, it is now Green minister-president Winfried Kretschmann working with SPD allies and business interests to develop it. 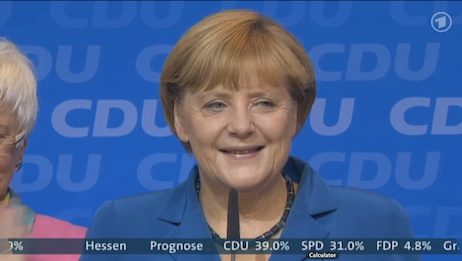 Polling data shows that the Green electorate isn’t incredibly dissimilar to the upper-class, middle-aged CDU electorate — and nearly half of them already prefer Merkel for chancellor. 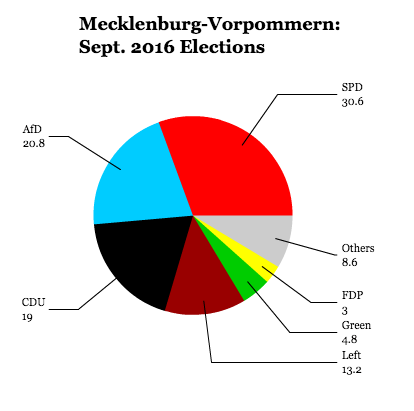 It’s not that it’s the likeliest coalition to emerge on September 23, but the chances of a ‘black-green’ government are currently underreported. 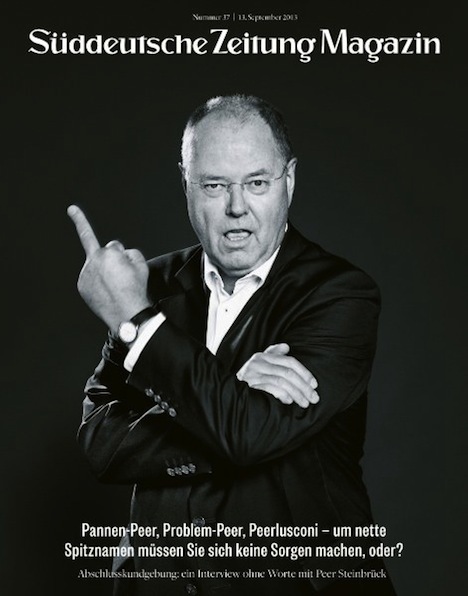 a look at why Peer Steinbrück’s candidacy for chancellor hasn’t succeeded.